What makes Superior's needles so good? When we decided to work with Organ Needle Company to develop a Superior needle, there were specific traits we wanted in a home machine needle. Durability, quality, proper stitch formation, and a long needle life. We are very proud of our Superior needles, especially since we were able to combine these important attributes into a home machine needle. Our titanium-coated Topstitch and Microtex needles are used and recommended by the pros for sewing, quilting, embroidery, applique, piecing, and more. Our go-to needle style is the Topstitch needle style. Topstitch needles have a larger eye (nearly twice as long as a universal needle), a deeper groove (to help protect the thread from excessive abrasion during stitch formation), and a light sharp point. We have extended the life of the needle by adding a thin layer of a ceramic, extremely-durable material called titanium nitride. This thin coating doesn't make the needle stronger (in terms of breaking strength); it increases the abrasion resistance of the needle at the point, extending the life of the needle by staying sharper, longer. Titanium nitride is the same coating found on surgical instruments, drill bits, and commercial tools due to it's amazing ability to keep tools in tact longer than uncoated steel or nickel-plated steel (standard sewing machine needles are nickel plated). There are many styles of home machine needles available. While some applications truly benefit from using a specific needle type, such as the Microtex needle when appliqueing with a fine thread, or twin needles for pintucks. We really like the Topstitch needle style for piecing, quilting, sewing, and embroidery. You may see needles with a chrome or chromium plating. Chrome-plated needles offer good abrasion resistance compared to an regular nickel-plated needle. However, chrome-plated needles do not offer as good of resistance as titanium-nitride coated needles. Titanium nitride is about 2.5 times harder than chrome and 4 times harder than nickel. 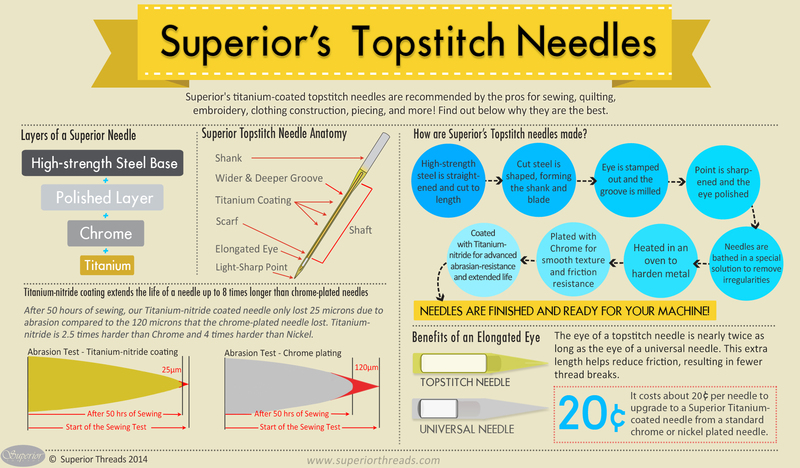 View our Superior Needle Infographic.